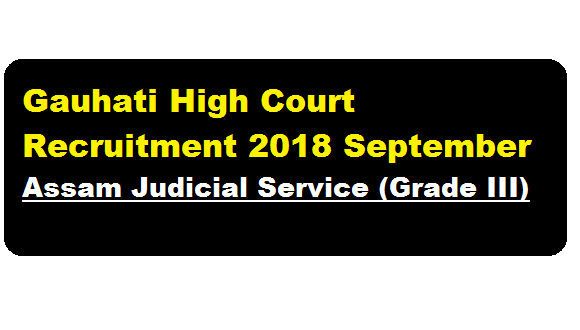 Gauhati High Court Recruitment 2018 September | Assam Judicial Service (Grade III) :- Gauhati High Court Latest recruitment 2018 notification in the month of September has been out. According to the Latest Gauhati High Court Recruitment 2018 September, Online applications are invited till 5.00 PM of 27/09/2018 from the eligible candidates for appointment in 42 (forty two) posts(existing and anticipated vacancy) Grade-III of Assam Judicial Service. The detailed recruitment is discussed below. In this section, we will discuss in details about the recruitment of Grade III Post under Gauhati High Court Recruitment 2018 September with vacancy details, eligibility criteria, salary with other details and requirement. Educational Qualification: Candidates must be holder of a Degree in Law granted by a recognized University established by law in India. Age Limit : Must not have completed, as on the last date fixed for receipt of applications 43 years of age in the case of candidates belonging to Scheduled Castes or Scheduled Tribes and 38 years of age in the case of others. Eligible & interested candidates may apply online by visiting Gauhati High Court official website – http://ghconline.gov.in from 15/09/2018 to 27/09/2018. Mode of Selection : The Competitive Examination shall consist of a Preliminary Examination (Screening Test), a Main (Written) Examination and a Viva Voce/Interview. Those candidates who will secure 60% or more marks in the Preliminary Examination shall be eligible for appearing in the Main Examination: Provided that the ratio on the basis of which the candidates will be called for the Main (Written) Examination shall be 1:10. (for one post 10 candidates will be called). All candidates who obtain 60% or more aggregate marks in the Main Written Examination subject to securing at least 45%mark$ in individual Paper-I, II, III & IV and minimum 35% marks in the Official Language Paper (Paper-V) shall be eligible for Viva Voce: Provided that Schedule Caste/ Schedule Tribe candidates who obtain 50% or more aggregate marks in the Main Written Examination subject to securing minimum 40% marks in individual Paper-I, II, III & IV and minimum 35% marks in the language paper (Paper-V) shall be called for Viva Voce. Hi, Thank you for posting this job.